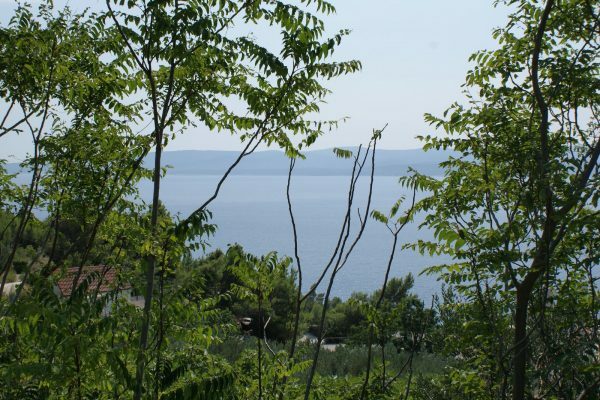 OM0711 – Seafront building land for sale Omis, the plot is in a magnificent location close to the sea and beach, and has lovely sea views. The plot spreads from the main road all the way to the pebbles beach. The property enjoys south east orientation and it is set in a lovely bay with lots of greenery. The neighbourhood is very nice. The plot is long and very wide in the middle section. A very clever design for a future villa has been made to maximise the views and the space of this plot. The future owner can build a villa based on this idea and thus create a very beautiful vacation home. The villa could have a couple of separate units – main building and the additional guest apartment. Or, it can all be one unit internally connected. The design incorporates an infinity pool and terraced garden. On the same level there would be an open space featuring kitchen, dining and living area – all opening to the terrace and the sun decking section. On the upper floor there would be bedrooms with bathrooms. The terrain is terraced so the lower ground floor would house the guest quarters. This plot touches the main road but the level of the road is not equal to the level of the terrain so the future owner would have to put a lift for the car. This design is possible and available as there are some examples in the area where the same approach was used. The owner of the property has already filed for the approval of such a connection to the main road and the official permission is expected in a few months’ time. The area of Mimice offers all the necessary amenities at hand – a shop, cafes, restaurants. It is only about 10 km from Omis. In Mimice you will have a chance to unwind and relish in being far away from city crowds, noisy places and traffic jams. Here you will find quiet cafes and restaurants situated on the beach, ‘konoba’ located in Mimice’s old area with Dalmatian atmosphere and cuisine.